Rather than relying on your memory when it comes time to do your grocery list, wouldn't it be easier to have already written down what you need? I like having a chalkboard in the kitchen to easily keep track of the things I run out of. If I don't write something down when I think of it, I never remember what it was later on. Chalkboards are so popular right now, as is "chalkboard art" with fancy writing and decorative elements. I decided what better thing to make a chalkboard out of for the kitchen than a clipboard? It can be hung on the wall, is compact in size, can be decorative, and the clip works to hold coupons you might have. 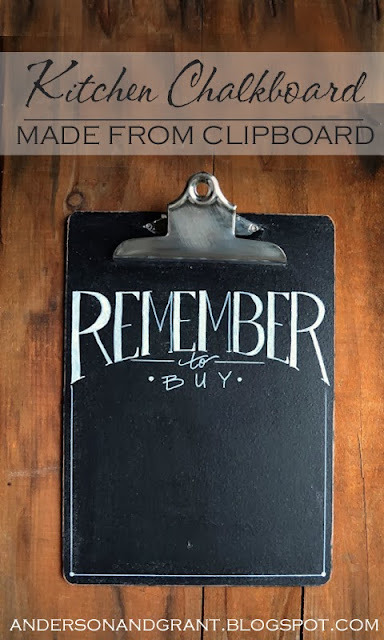 To create this product, I started with a clipboard from my local office supply store. It was very basic so I stained the back and edges to age it. I rubbed the edges with candle wax so that the paint would sand off easily when I was done. I also roughed up the metal clip with some sandpaper. Then, I painted the clipboard with four coats of chalkboard paint....three was probably enough, but I wanted to make sure it had a good finish. When the piece was finished, I sanded the edges to remove some of the paint....I wanted to the piece to look like it had been used for awhile. I also rubbed some acrylic black paint over the metal clip to age it a little more. (I should have done this BEFORE writing the words on, but it worked). You also need to "season" the chalkboard before you use it. Instructions on how to do this can be found here. This idea could be done with any wording and used elsewhere in the house...your office, laundry room.......??? You can try this idea yourself, or if you're not "crafty," I have some available to purchase in my Etsy shop. So what do you think....will this help you in the kitchen?